Was born in 1843, and educated at Eton. He entered the navy in 1857, and served through the China War, 1857-1861, on board H.M.S. Furious (Captain Sherard Osborn), carrying the British Ambas­sador, the Earl of Elgin. He was present at the capture of Canton, 1857; signature of first British Treaty with Japan, 1858; capture of Peiho Forts (when he landed), 1858 ; present at signature of Treaty at Tientsin in same year; and at the bombardment and forcing of the Nankin Forts (then held by the Tai-pings) by the Furious, with other British men-o’-war. He was on board the Furious on her arduous passage up the Hankow with Lord Elgin and Embassy on board, a passage effected by a foreign vessel to this important trade centre for the first time. He was also present at the capture of the Peiho Forts, 1860, and part of the march on Pekin, receiving a medal and three clasps. He accompanied Admiral Sherard Osborn to China as Secretary, with rank of Commander, 1863. 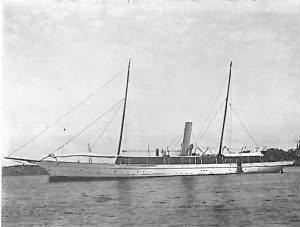 The flotilla having been dispersed, in 1868 he purchased the flagship Keaugsu, took her to Japan, and sold her to the Japanese, the Keaugsu being the first man-o’-war, built as such, owned by them. He commenced yachting in 1869, and has owned Island Queen, 17 tons; Coquette, 25 tons; Boulotte (which he built in 1874), 14 tons; the Baladeuse, s.y., 47 tons; Primrose, s.y., 81 tons; Deva, s.y., 147 tons; and now owns Aldebaran, s.y., 260 tons, Ellinor (ex Princess Alice), Aux, s.y., 593 tons, now under charter to the Admiralty for surveying purposes. In 1873 he became interested in the chemical industry, and is now chairman of Spencer Chapman and Messel, Ltd. He married, in 1869, Ellinor Sydney, daughter of the late Admiral the Hon. Keith Stewart, C.B., who died in 1901, by whom he has one son and three daughters, of whom two are married. He is a Fellow of the Royal Geographical Societies of Great Britain and France, and a master mariner. Clubs: Royal Yacht Squadron, Royal Dorset, Yacht Club de France, and St. James’s Club. Residences: 84, Eccleston Square, S.W. ; Dormy Cottage, St. Briac, Brittany ; Villa Allegria, Cannes.